I am looking for a pen kit that would be good for pen spinning. Characteristics would be long and straight, with the weight towards the ends. it would be nice to have a tube size slightly smaller than 10 mm. Thanks! First one that pops into my mind is PSI's RAW. One of the versions sans clip I think would work, though the cap end is heavier than the finial (perhaps the aluminum one would be a good choice). Tube is 3/8ths, so a bit less than 10mm. Just a thought. It is a rollerball, if that matters. The Long Click has a tube of 9.25mm The bits used to drill is .375" I drill with a .3680" (letter U) bit. The center of balance is closer to the click end, but that is with the clip. Removing the clip should help move the center lower. Never heard of spinning pens--sort of like spinning figit sticks? I'd think if one were making a pen just for this purpose, that one could turn the barrel in such a way that the contact surface was the balance point. Will the end result be pleasing to the eye--dunno! Just thinking out loud. The teacher pen kit ! Years ago we had a Japanese exchange student that lived with us for a year. 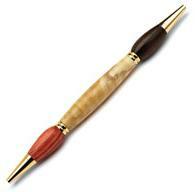 He used to spin his pen or pencil using his thumb and index finger. He could really get them going. I asked him one time what else he could spin? He told me he could spin a knife, fork and spoon and then demonstrated it for me. Since then I've seen quite a few people spinning pens. I've tried to figure it out but I think I'm just to clumsy. All I can do is roll them between my fingers...until I drop them. That's what Taka did but he also spun it off the top/back of this thumb. Never could figure out how he did it though.